autolycus is an utterly independent literary journal, created by Genie Cartier and Emilio Aldrich. We aim to publish talented unknown writers, and sell the journal online and by consignment. All proceeds will go to the production costs of the journal. We hope to create something dripping with artistic integrity, with no funding or support of any kind from The Man. 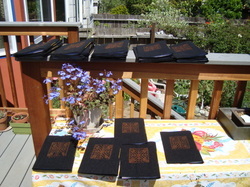 Each copy of autolycus is handmade, and therefore each one turns out a little different from the next. We only make 25 copies of each issue, and the copies are numbered. We put out 2 issues per year, one in May/ June, and one in December. Lying and scheming whenever he speaks. Just as he was as a Greek demi-god. An ancient poet feigning youth.